One of the calls we get a lot, is to see if we can shoot video at tradeshows. Because companies and corporations drop a serious investment in tradeshows. The cost of attending, with travel. The exhibitor fees. And the booth construction. With all this investment, businesses want to make sure the marketing pays off. And that’s the bottom line: Sales. So video at the tradeshow extends the reach of that investment. 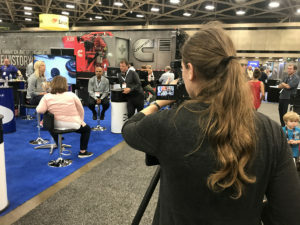 Whether video is used to grab the attention of potential customers walking by or used as a broadcaster on social media, video at the tradeshow can magnify the marketing and multiply the results. You have those huge monitors. You want people walking by to be drawn in to your booth. Engaging videos playing on the screens, usually in a loop is an ideal method for capturing attention. 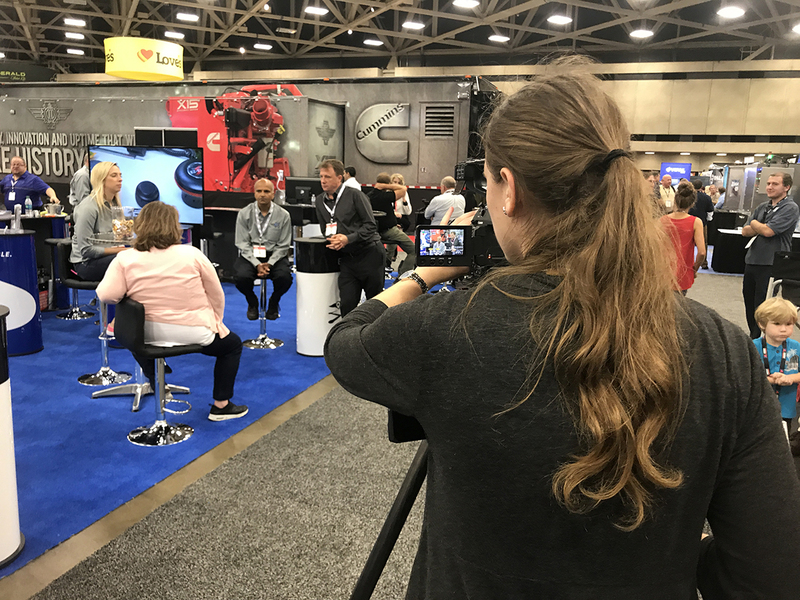 Videos are usually made with the soundtrack optional– most tradeshow floors are noisy and the videos playing cannot be dependent on sound. Here’s an example of a video we did for a construction company client. Clients sometimes want video coverage of their booth. They might use it later for social media or other marketing. Or to cover a big announcement happening at the tradeshow. This by far is the biggest call we get. A tradeshow floor is the perfect place to grab those customer testimonials that are otherwise hard to get or expensive due to all the different geographical locations you’d have to go to get that interview. We bring the camera, small lighting package, audio and setup to move quickly. Here’s an example we did for Pratt & Whitney Canada at the recent HeliExpo. This has become an increasingly important service. For the Pratt & Whitney job above, they wanted the videos same-day to post to social media. Therefore, having an editor with computer at the tradeshow can power a lot of marketing muscle. If you’d like to know more about our tradeshow and conference capabilities, click on contact above and give us a ring.